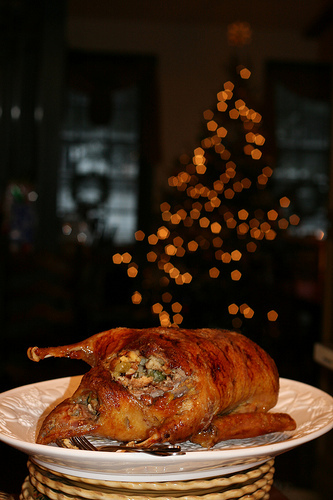 We decided to be adventurous this Christmas Day and added duck to our classic ham and turkey menu. It was our first taste of home cooked duck and my first attempt at gravy. The dark duck meat was surprisingly decadent (though in short supply), and the orange gravy was the ideal flavor enhancement. The stuffing is a bit dry on its own, so make extra gravy. Oh, and don’t add flour to your gravy after it’s been heated. It’s impossible to break up the lumps, and it’s a mistake I won’t make again. All in all, a successful addition to a traditional meal! Sprinkle inside of duck with salt. Prick skin several times and set aside. 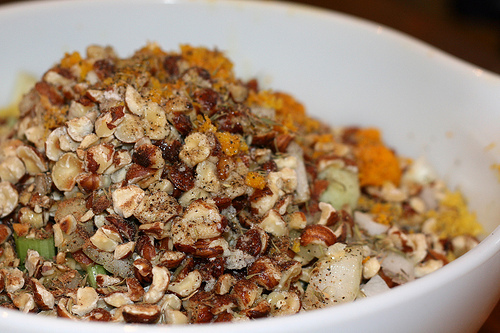 Combine stuffing ingredients, and spoon into ducks. Place with breast side up on a rack in a large shallow roasting pan. Brush with butter. 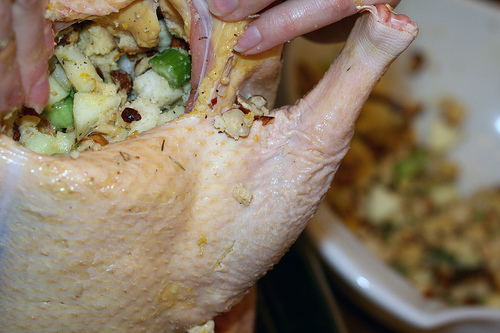 Bake, uncovered, at 350° for 2-1/2 – 3 hours or until a meat thermometer reads 180° for duck and 165° for stuffing. Remove stuffing and keep warm. For gravy, combine 3 Tbsp pan drippings, flour, salt and pepper in a saucepan; stir until smooth. Heat until bubbly, stirring constantly. Gradually add broth. Bring to a boil; cook for 1-2 minutes, stirring constantly. Add marmalade; stir until smooth.